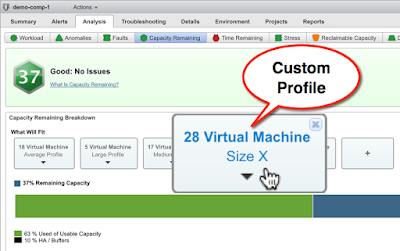 using the canned Analysis > Capacity Remaining dashboard on the vSphere Cluster level. However, there is no way to access these custom profile metrics through any of the metric pickers so they cannot be added to custom dashboards or reports. API and Super Metrics to the rescue. In this post we will cover how to access and expose the custom profile metrics to the GUI so they can be easily leveraged throughout the product's various visual elements. I had many customers ask for this in the past so figured it's time to let the cat out of the bag and let the world know. A customer recently asked if it was possible to compare the same metric from multiple VMs in a single dashboard. Yes it is, and here is how it's done and what such a dashboard may look like. 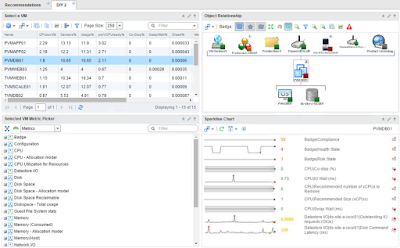 This type of dashboard is very useful if you want to evaluate and compare performance of several VMs carrying out the same or similar work. For example, it could include a number of load balanced web front-ends or some other VMs hosting a number of different enterprise applications. It can also be used to compare how similar VMs perform on different vSphere Hosts running on different generation hardware. Of course the same concept can be applied to comparing different vSphere Hosts or Datastores themselves. 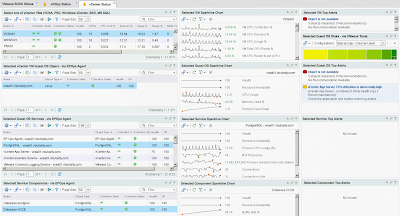 While working with vROps over the past year or so, I have had quite a few customers ask for a "Monitor the Monitor" type dashboard. 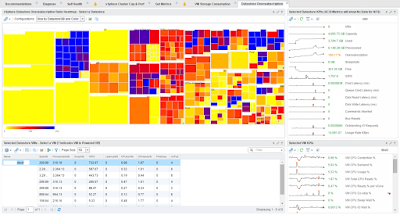 I thought about it and decided that this would not only come in handy when trying to keep an eye on the vROps' health, but also provide some basic capacity and performance stats. 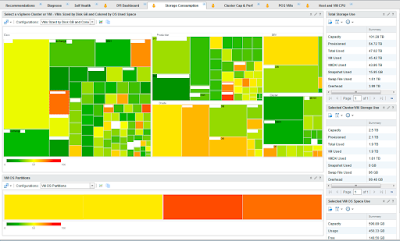 The capacity part of this dashboard could be especially useful when planning an analytics cluster upgrade or when adding a significant number of new objects and metrics to monitor, empowering you to make more educated scaling decisions. (See my previous posts "When and how to scale your monitoring solution?" 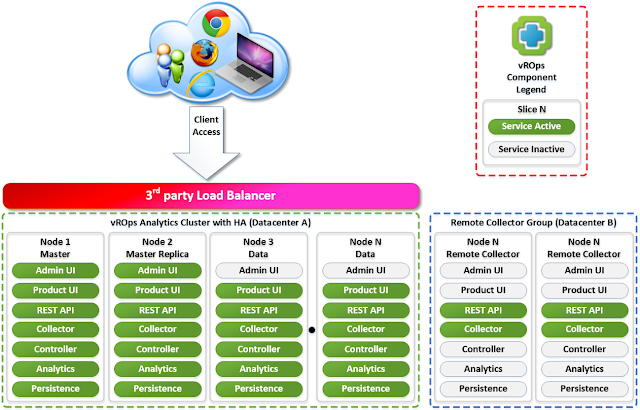 about resizing your vROps Analytics Cluster to meet the needs of your growing environment.) Normally, all this info has to be gathered from several places within the product, which may be too overwhelming for a casual product user. So, the goal of this dashboard is to provide all of the useful nuggets of information in a single pane of glass. Honored to be awarded VMware vExpert 2016! I'm humbled and honored to be selected for the VMware vExpert 2016 Award. Thank you everyone for reading my blog! The VMware vExpert program is VMware's global evangelism and advocacy program. The award is for individuals, not companies or VMware employees, who have significantly contributed to the community of VMware users over the past year. The VMware vExpert title is awarded on an annual basis to individuals for their commitment to sharing their knowledge and passion for VMware technology, above and beyond their job responsibilities. 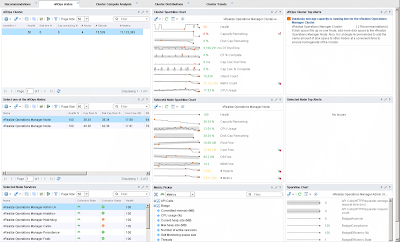 VMware just released a new update to its popular cloud operations management and monitoring suite. 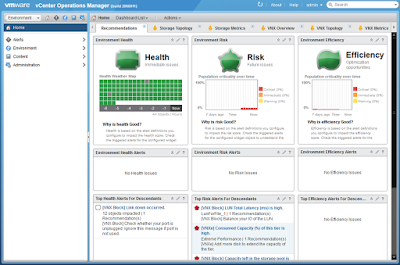 vRealize Operations Manager 6.2 is the newest release of the VMware's integrated vRealize Operations Suite in the SDDC family. Updates address all major features of the product including installation, configuration, licensing, alerting, dashboards, reports, policies as well as introducing some new enhancements. 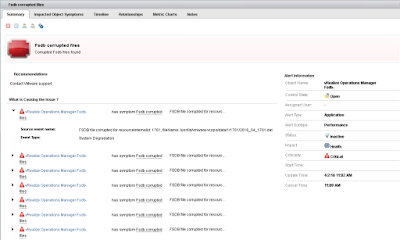 A lot of my clients want to deploy vROps with High Availability (HA) option enabled. When I hear this, I simply ask them to name at least one business requirement that dictates the use of HA for vROps in their environment. The answer I typically get is something like this: "because we want HA" with some undertones of: how dare you ask, you should know we're a very important company! Well, working as a vROps consultant over the last year, I realized that there are a lot of misconceptions about the vROps HA feature. 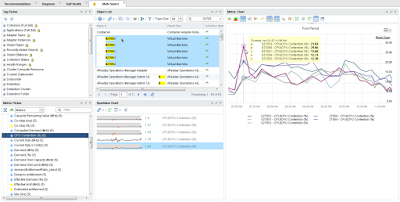 In this post, I would like to clarify some things about vROps HA and hopefully empower you to make the right decision when designing your vSphere monitoring solution. 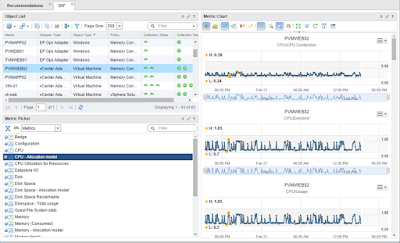 VMware vROps - When and how to scale your monitoring solution? 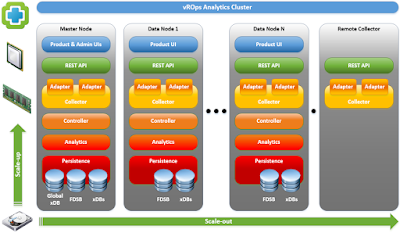 There has been a lot of hype surrounding the new scale-out vROps architecture, which enables you to easily add more nodes to vROps analytics cluster as needed. However, is scale-out always the right choice? Sometimes, a scale-up option may be better suited depending on what shortfall you are trying to address. In this post, we will go through some common scenarios that will help you make the right decision for your environment and hopefully make this process more of a science than an art. A customer recently challenged me to create a Datastore dashboard showing how oversubscribed their thin provisioned vSphere Datastores are. This was a twist on my VM Storage Consumption dashboard that I have been doing for a while and will post next time. The goal of this new dashboard is to visualize the Datastore subscription rate of the thin provisioned Datastores in the virtual environment. 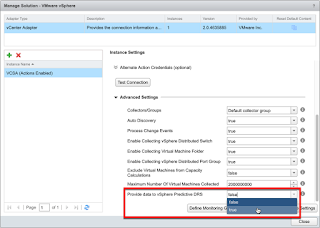 In addition, it can show impacted virtual machines as well as some additional storage-related key performance indicators.